At Choonara Orthodontics, we provide exceptional orthodontic care to children, teenagers and adults who live in Johannesburg, Randburg, Sandton and the surrounding areas. When you’re our patient, Dr. Choonara will align your teeth using the orthodontic appliances that best fit your needs. He will also help ensure that you can enjoy your new smile for the rest of your life by providing you with a retainer to wear once you’ve finished with active treatment. Retention is a critical follow-through step, that begins after your treatment ends, that typically requires wearing a retainer. Without this orthodontic appliance, your teeth will naturally shift back into their original positions. If that were to happen, all the time and money you invested in orthodontic treatment will have been made in vain. Your teeth are held in place by a network of fibers called periodontal ligaments. Once your teeth have been moved, it takes several months for these ligaments to adjust to the new positions your teeth are in. In short, if you want to enjoy your new smile for the rest of your life, you must wear a retainer according to the directions we provide you with. You can expect us to fit you for your retainer on the same day we remove the braces from your teeth or when you’re finished with Invisalign treatment. We will clean your teeth and then take impressions of your bite which are necessary for making your custom retainer. There are three retainers used today, with each type having unique features. 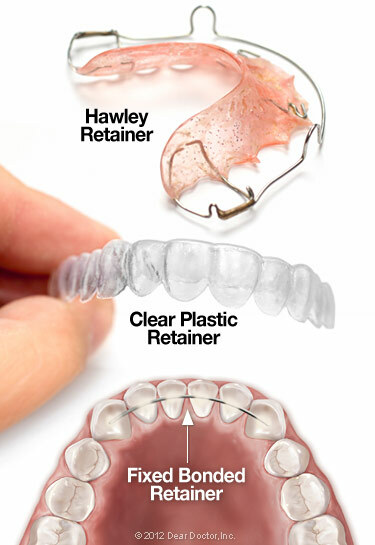 Hawley Retainer - The Hawley retainer is the most common type which most of us are familiar with. This type of retainer consists of a piece of acrylic that’s molded to fit your mouth, with a wire that holds your teeth in position. This retainer is rather simple in design, durable and easy to put in and take out. You can even choose to personalize a Hawley retainer if you like, by choosing from a variety of colors and designs for the plastic arch. Clear Retainer - The clear aligner-type retainer works in the same manner as the Hawley retainer but without the visible wire. While it is just as easy to put this retainer in and take it out, this type of retainer is not as durable as the Hawley retainer. Therefore, we do not recommend this type of retainer for patients with certain conditions/habits like teeth grinding. Fixed Retainer - Just as the name implies, a fixed retainer is not one that the wearer can remove. A fixed retainer is similar to lingual braces as it is bonded to the lingual or tongue-side of the teeth and uses a wire to hold the teeth in place. This type of retainer may be worn for several months or longer, depending upon the particular case. The fixed retainer is often recommended where there’s a high risk that the teeth could revert back to their former positions. Regardless of what type of retainer you wear, it will take you a little time to adjust to it being in your mouth. It is common to notice you’re producing more saliva than normal when you first start wearing your retainer. It is also common to find it more difficult to speak clearly during the first day or two. However, both these issues will work themselves out in no time flat as you get used to having the retainer in your mouth. It is likely that we will tell you to wear your removable retainer 24/7 for the first few months to a year. Then we may say it’s fine to just wear it at night. Later on, we may tell you to put your retainer in for just a few nights each week to ensure your teeth do not shift out of position. In order to keep your retainer clean and fresh, you will need to properly care for it. If you are wearing a Hawley retainer, simply brush it gently with your toothbrush and a small dab of toothpaste and then rinse it off when done using cool water. If you are wearing an aligner-type retainer, a toothbrush can scratch the material. So you should clean your retainer every day using a denture cleaner or a cleanser that’s made specifically for retainers. If you’re wearing a fixed retainer, you can keep it clean by brushing the retainer with your toothbrush and flossing your teeth as you normally would. It is a good idea to use a floss threader or an interdental brush as it will make cleaning around your fixed retainer easier. If you have any questions about the retention phase of your treatment or any of our other services, please feel free to contact us as we’re always here to help. You can reach our Johannesburg office at (011) 678-8090 and one of our dedicated team members would be happy to assist you. We want you to enjoy your newly acquired healthy and beautiful smile for a lifetime, so be sure to follow the instructions we give you about your retainer.